Provides for fast and easy professional installation of check valve O-Ring MC200 or Rebuild kit MC300 without having to remove tank from the bike. For 2001 and newer fuel injected Harley Davidsons®. The industry’s first and only. 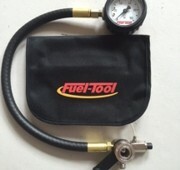 Provides for simple, fast and accurate fuel pressure checks. Fits 2001 and newer fuel injected Harley Davidsons®. Solid brass adapter and release valve, steel housing (100 psi) gauge, stainless steel springs, Viton O-Rings, O-Ring lubricant and nylon storage pouch. Push button completely releases all fuel through the drain line. Long hose with swiveling gauge allows you to easily attached the gauge to your 2001 and newer Harley Davidson® Motorcycle and check both static and under load fuel pressure readings. Solid brass adapter and release valve, steel housing (100 psi) gauge with felt covered magnetic backing, 16" long fuel resistant hose with swiveling gauge end, stainless steel springs, Viton O-Rings, O-Ring lubricant and nylon storage pouch.